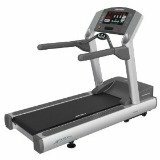 The SportsArt Fitness TR20f treadmill is actually the company's current entry level treadmill, listing at just $2299 and often available on sale for less. The beauty of the TR20f is that it delivers a premium experience but combines it with a motorized, folding deck. There are 10 workout programs on the TR20f, including Interval, Target HR, Hill, Track and three options for customizing your routine. The console is an easy to read, backlit LCD that gives you Calories Burned, Calories per Hour, Distance, Speed, Incline, Time, METs, Pace, Heart Rate and Target Heart Rates. UPDATE: As of 2016, the TR20f is no longer available for sale. You can check out all of their latest treadmills for sale here. Reviews of the SportsArt Fitness TR20f treadmill frequently focus on the motorized QuikFold deck, which is the most outstanding feature for lots of owners who were looking for a premium machine that would easily fold up without having to pay an outrageous price. 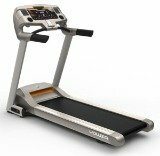 At least one review noted that the TR20f treadmill has a silky, cushioned feel with the SDS system and that the 20"x58" running deck is pretty generous in a folding model. The one feature that users missed or wished they had was the ActiveZone monitor on the console, which highlighted the muscle groups you were working at any given time, although most understood that some of the extras had to be sacrificed so that SportsArt Fitness could focus on superior performance and a reliable folding deck. 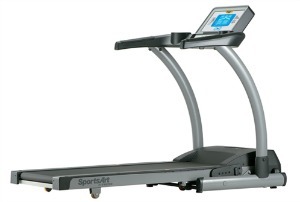 SportsArt Fitness performed a small miracle with their entry level, folding treadmill. The TR20f is one of the best folding units on the market anywhere near the $2000 to $2500 price point. You do lose a few things here and there. This model has a maximum speed of 10 miles per hour instead of 12 mph. The ActiveZone readout is gone. You lose a bit of power on the motor, but it's still more than adequate at 2.8 hp. If you want a premium folding treadmill that can give you an excellent workout without having to pay an arm and a leg, the SportsArt Fitness TR20f treadmill may be perfect for you.